We call this bad boy the “do it all” reel. We’ve used this workhorse surf fishing in So Cal, light steelheading in Oregon, hucking nasty streamers to ravenous browns in Montana, and stalking bones on the flats in Belize. Designed for running 5 through 7 line weights. The Finatic reels cassette comprised of Rulon® and precision stamped stainless steel discs is employed in all models. With multi-disc drag, you are applying breaking pressure and heat dispersion over several surfaces, virtually eliminating start up inertia and stick slip problems. For 2018 we’re incorporating a mist finish on our entire line up of reels. Misting creates smoother edges and provides for a more consistent non-reflective finish throughout. Plus it looks pretty damn cool! The Gen 2 Finatic incorporates an Ultraflon sleeve that covers the aluminum shaft and separates it from the aluminum crank handle. By doing this we’ve eliminated the chance for galvanic corrosion, so your crank will spin effortlessly for years to come. The Gen 1 Finatic reels have 7 windows while the new Gen 2 Finatic has 9 windows. Hatch has created a concave surface inside of the frame as well. By adding two extra arms in the frame it allows us to eliminate unnecessary weight through this feature, thereby making the reel lighter without sacrificing any strength. Over the past few years we’ve seen some big changes in fly fishing. Specifically, the amount of time anglers spend in the water in pursuit of fish. It’s an exciting time for sure, and it’s forced us to reimagine how our reels are sealed in extreme environments. For 2018 we’ve added lip seals and sealed bearings to all our reels as a one two punch to protect against the elements and add a whole new level of water protection. Creating a bomb proof frame to spool connection is essential for maintaining strength, and true-spin consistency; and that's how the Finatic reels come. The machined reel seat is our signature and we’re sticking to it. A solid is always stronger than two parts attached by screws. By doing this it eliminates the common problem of screws rotting from corrosion and becoming loose. 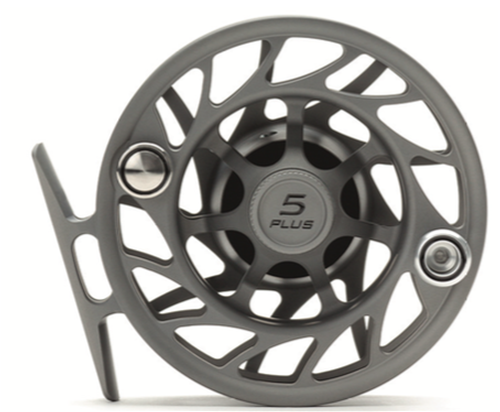 Every Hatch reel is finished with Type II anodizing available in six color combinations: Black/Silver, Clear/Blue, Clear/Green, Clear/Red, Clear/Black, Gray/Black.